You are currently browsing the tag archive for the ‘Asylum’ tag. Movement for Justice have organised a demonstration outside the Home Office in Cardiff today for Maimuna Jawo and Josephine anad against the treatment of people who are in the UK after seeking refuge from the practise of FGM. Grant Maimuna Jawo Asylum Now! Grant Josephine Asylum Now! Women fighting to end FGM must be protected! The demonstration, at 31-33 Newport Road is due to start at 1:30pm and is supported by No Borders South Wales – some of us will be there in solidarity. Sanctuary now for all women who flee FGM! A new report: “Chance or choice? 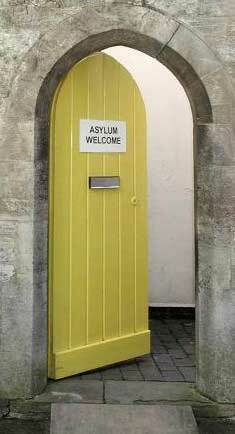 Understanding why asylum seekers come to the UK” has been published by the Refugee Council. The report is the result of research undertaken by Professor Heaven Crawley, Director of the Centre for Migration Policy Research at the University of Swansea. Following the successful day of action against BMI last month, we’re calling on people to do the same again and shut down BMI on Thursday 20th November. These people haven’t done anything wrong. Airline companies are a key link in the deportation industry. Without them it would be impossible for the state to implement this aspect of the migration regime and there can be no migration controls without deportations. But BMI were given plenty of information and time to ‘investigate’. Despite hundreds of telephone calls, emails and faxes to BMI raising objections and concerns, they chose to ignore this and ensured that the deportation took place. BMI employees told those ringing on the day that they could not refuse to carry people being removed and it was out of their control. However, other airlines have refused to carry out deportations in the past. XL Airways announced in 2007 that they would no longer carry refused asylum-seekers who were being forcibly removed from the UK. BMI is the UK’s second largest full service airline. By taking part in deportations they do the governments dirty work for them and in the process make money from human misery. In 2007 BMI reported profits of £15.5 million. How much of this was soaked in the blood of migrants who they deported against their will? Following the successful day of action against BMI on October the 20th, No Borders South Wales are calling for another day of action to shut down BMI on the 20th of November. 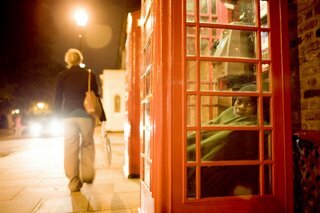 We call on BMI to no longer take part in the forced deportation of migrants. We are focusing this campaign around the 20th day of each month, after the date that BMI took Babi away from those who loved him and those he loved. Please contact BMI and register your disapproval at their role in deporting people to places they do not wish to go back to, for whatever the reason this may be. 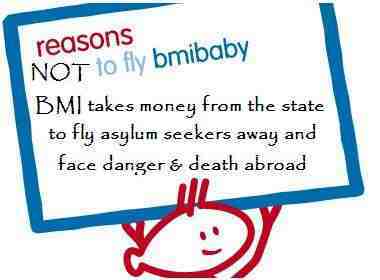 Urge BMI to follow the other airlines who have taken an ethical stance and who refuse to carry out any more deportations. On 20th November let’s once again hit BMI with everything we’ve got! Ring, fax and e-mail the company as much as possible on this day and every month thereafter until BMI no longer take part in this cruel practice. Aberdeen, Belfast (City), Birmingham, Bristol, Durham Tees Valley, East Midlands, Edinburgh, Glasgow, Jersey, Leeds Bradford, London City, London Gatwick, London Heathrow, Manchester, Newcastle International, Norwich. For further contact details you can download the leaflet we put together for the October 20 day of action. Jean Pierre set to be deported at 6.15am! Cameroon national and victim of torture Jean Pierre Gueutchue, was given very last minute removal directions today for tomorrow, 6:15am. Once again this goes against the usual 72 hours notice most deportees are given. Jean Pierre Gueutchue a Cameroon national, is currently detained in Campsfield IRC and due to be forcibly removed from the UK tomorrow Monday 6th October 2008 at 06:15hrs on British Airways flight BA 302 to Paris and then Air France flight AF940 to Douala, Cameroon. This will be the third attempt to remove Jean Pierre, who fled Cameroon after being tortured for his political activities, arrived in the UK in 2003 where he made a claim for asylum. All his appeals have been turned down and a fresh asylum claim was refused On Tuesday 15th July. Telephone British Airways on 08444 930 787. Let them know their image and business will suffer if they continue with deporting Jean Pierre to an unsafe and potentially life threatening situation. Fax Willie Walsh, Chief Executive Officer British Airways on 020 8759 4314 and urge him not to carry out the forced removal of Jean Pierre Gueutchue. Use this model letter, you can copy/amend/write your own version. Please include all the details: Jean Pierre Gueutchue a Cameroon national, due to be forcibly removed from the UK tomorrow Monday 6th October 2008 at 06:15hrs on British Airways flight BA 302 to Paris and then Air France flight AF940 to Douala, Cameroon. Fax Rt. Hon. Jacqui Smith, Secretary of State for the Home Office on 020 8760 3132 (note new number) asking that Jean Pierre Gueutchue be granted protection in the UK. Use this model letter, you can copy/amend/write your own version (if you do so, please remember to include the HO ref M1206111). If it is the case that Jean Pierre does fly on the BA flight then please: Ring Air France from 8am tomorrow on 0871 66 33 777 and ring their Customer Relations line from 9am tomorrow: 0870 142 4343 to urge them to not allow Jean Pierre to fly. 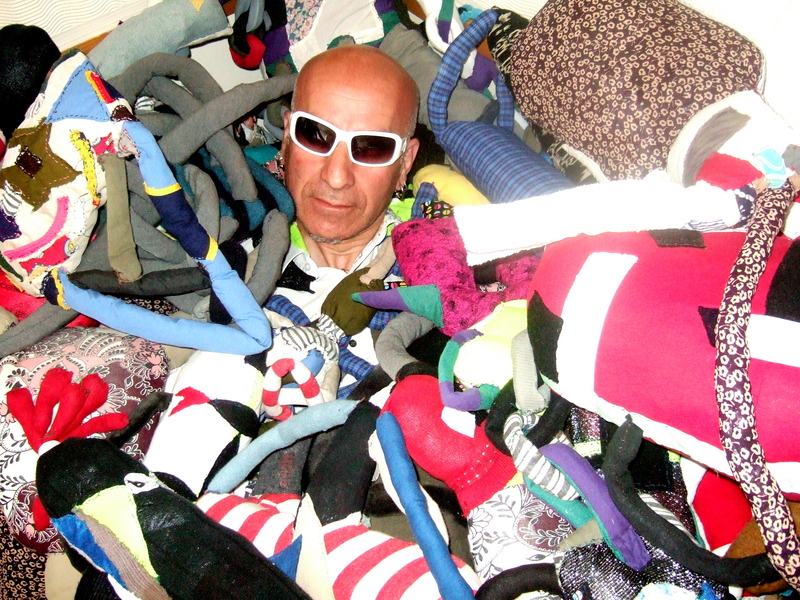 On 20th September at 3.15pm gay radical artist and No Borders South Wales activist BB was deported on a BMI flight to Azerbaijan. 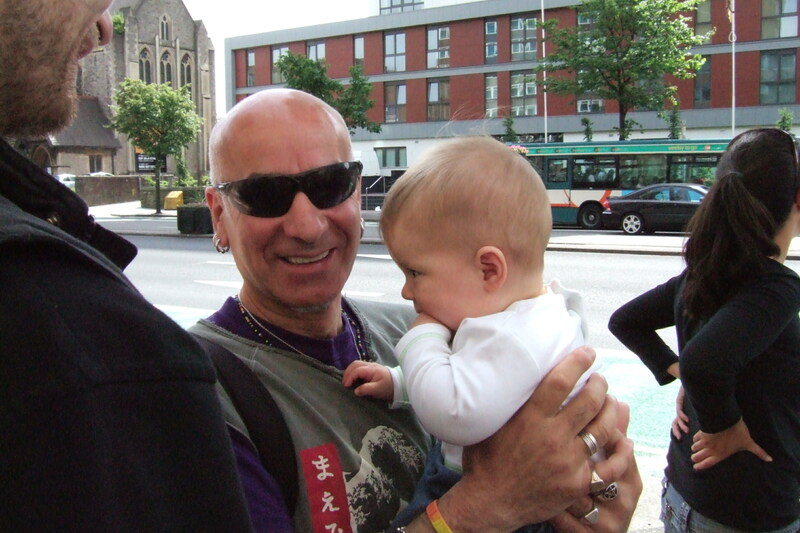 BB sought asylum in the UK in 2006 following years of persecution because of his sexuality. His brothers on finding out that he was gay had threatened to kill him, with one attack from his eldest brother leaving him with only eight teeth. The radical nature of his art and poetry had also led him to become a target of government repression. A number of his artworks had mocked members of the ruling elite. The most famous of which, and the one that led to a number of threatening visits by the Ministry of National Security (MNS), Azerbaijan’s modern day version of the KGB, was a photographic piece in which he parodied the ubiquitous statues of the Azerbaijani President, who, following the collapse of the Soviet Union, destroyed many of Lenin’s and erected ones of himself instead. 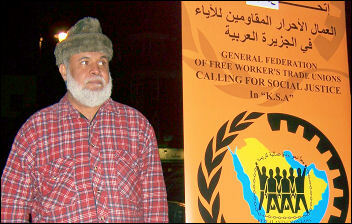 BB was dispersed to Cardiff in December in 2006 and quickly immersed himself in the activist scene there. He regularly helped out at Cardiff’s social centre PAD and despite his precarious immigration status was involved in many campaigns and was a much loved and active member of No Borders South Wales. BB was snatched on Tuesday when he attended his weekly signing at the UK Border Agency building in Cardiff. Within an hour of being arrested BB was handcuffed, bundled into the back of a blacked out van and taken to Rumney police station. Here a friend was able to see him and found him a complete wreck. The day after his incarceration a demo was held outside the UK Border Agency building at 31-33 Newport Rd, Cardiff. Over 50 people gathered outside the building in order to show their solidarity with BB with the front steps of the building being covered with banners. Many then went up to Rumney police station and were able to pass BB a card containing messages of support. 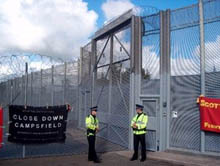 Late Wednesday night he was then transported under the cover of darkness to Campsfield detention prison, Oxford. Whilst in detention BB was given a medical examination. The subsequent report strongly recommended that BB be given a proper psychiatric evaluation. Despite this, the Home Office continued with its plans to deport. BB was initially due to be deported at 8pm on Saturday the 20th on an Azerbaijan Airlines flight to Baku. However, following a huge amount of harassment from friends, supporters and many other activists from around the country Azerbaijan Airlines bowed to the pressure and refused to carry him. But this did not stop the Home Office rescheduling his deportation to a British Midland Airways (BMI) flight at 3.15pm the same day. This time despite a huge struggle, which continued up until the last minute BB was eventually deported. “While BB is currently safe, if anything happens to him the state and BMI will have blood on their hands. His deportation has left a huge hole in all his friends lives and demonstrates the brutality of immigration controls. He was ripped away from his new home, friends and people that loved him just so the government can keep its deportation statistics up. We didn’t fight to keep BB here out of compassion or because he had suffered. We don’t care why BB came. We fought for BB because but he is one of us, a fighter for freedom of movement, for equality, and a world without borders”. We will post more precise details soon but we can assure all those we are concerned about him that BB is currently safe. While BB’s deportation has left us all saddened and very much in a state of shock it has also served to doubled our resolve to continue to struggle for an end to all migration controls and the criminalisation of people who have done nothing other than cross artificial, yet brutally real borders, in order to build new lives for themselves. We are now more than ever committed to fighting for a world where people are free to move as and when they like. Where people’s relationships can not be torn apart just because someone happens to have been born in one place rather than another. We are heartened by the solidarity for BB that appeared across the blogsphere, we tried to keep a tally of blog posts as the campaign progressed, here’s a few that have appeared since BB’s deportation; Cosmodaddy, Freedom for Tooting, Gays without Borders, Ravenhurst, LGBT Asylum News, Gay Activist, Leanne Wood, Unzipped, Cardiff Radical Socialist, JFLAG and Queers without Borders – sorry if we have missed anyone. 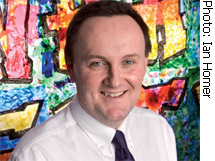 The Children’s Commissioner for Wales, Keith Towler, has condemned the the removal process implimented by the UK Border Agency, whilst speaking to delegates from across the UK at the launch of the Shared Futures project in Cardiff on Wednesday 17th September. He recounts a story which would be familiar to anyone who has looked into the way in which the UK Border Agency operates. “I took a call recently from an incredibly distraught woman in Swansea who had watched two vans with people in uniforms come to a house in her street around 8am and remove a family. The mother of the family could speak little English and her eldest son was no older than 13. He had good English and was translating what was happening but things got emotional and the boy lost it. As I learned later, it was totally out of character but this child had been put under so much pressure that he could not cope. In response, those in uniform took a punitive approach. They separated him from his family. He went in one van. The rest of his family was put in the other. It was not until later that night in Manchester airport where they had all been taken, that they were reunited for a flight out of the country. Then you should be concerned about the repression of migrants by government and corporate immigration ‘services’. ID cards have already been tested on migrants seeking asylum and will be used next on other ‘foreigners’. The Application Registration Card has to be carried by everyone seeking asylum for their regular reporting and to obtain National Asylum Support Service payments from the post office. It is an ID card containing the bearer’s fingerprint, photograph, name, date of birth and nationality. From this November foreign nationals wanting to enter the UK will have to apply for “biometric residence permits” and their details will be entered into a national identity database. From next year foreign nationals living in the UK will begin to be issued with ID cards. Once migrants have been used to test the scheme, the government’s plan is to issue identity cards to UK citizens on a voluntary basis from 2010, then in 2011 bringing in compulsory ‘choice’ of a passport, ID card or both. The fact that ID cards and fingerprinting technology has been tested on refugees shows that the state is prepared to impose ID on those people with the least voice to oppose it, before rolling it out to the whole population. The government is trying to get ID plans accepted by cynical scapegoating of immigrants especially ‘asylum seekers’ . No Borders South Wales will be holding a protest against ID cards, biometric passports, and the surveillance society in general on Saturday 4th October at 2pm outside the Passport Office, Olympia House, Upper Dock Street, Newport, NP20 1XA (map). We will be distributing leaflets and raising awareness about the new ID laws that come into force this November. Come and join us. This article first appeared in the new No Borders South Wales Newsletter, you can download a copy here. Activists from No Borders South Wales, No Borders Bristol, and Zimbabwe Development Support Association demonstrated outside the UK Border Agency’s regional office for Wales and South West in Cardiff today in protest against the UK’s racist and repressive migration controls. Despite some rather petty territorial behaviour from the Border Agency staff (who removed a banner that was attached to ‘their’ railings) and a short visit from local police who had been ‘sent down to check that everything was passing off peacefuly’, the event went very well. The turn out was good, the response from passers-by was great, and we managed to hand out a load of leaflets to asylum seekers being forced to sign on inside the building. One of the main reasons we do a regular picket of this place is to distribute leaflets to the refugees who are victimised there. By informing them about the support that’s available and urging them to campaign for the right to stay in the UK, we encourage people to take control of their lives rather than submitt to whims of an asylum regime that aims to de-humanise them at every turn. In the wake of the recent hunger strike by 50 inmates of the squalid detention prison at Campsfield IRC over their continued detention, it was truly inspiring to see people coming together to offer solidarity to migrants living in our community. The hunger strike was started by 13 Kurdish refugees after news that Hussein Ali, who had attempted to claim asylum in the UK, commited suicide two days after he was forcibly deported to Iraq. Pregnant mother Kemi Ayinde and family have been told this week that their application for a Judicial Review of their asylum claim has been refused. They are liable to be detained and deported at any time. The family returned to Cardiff three weeks ago after being detained in Yarl’s Wood Immigration Removal Centre in Bedfordshire, after being snatched by UK Border agents from their home in the early hours of 17th June this year. Two attempts were made to deport the family in July but after a high profile campaign and an application for a Judicial Review, the family were released. Kemi has been told that the baby is not growing normally and her pregnancy may have to be terminated. Her GP and midwife have both stated that they believe that the problems she is having with her pregnancy have been caused by the stress and shock of being detained and threatened with deportation. 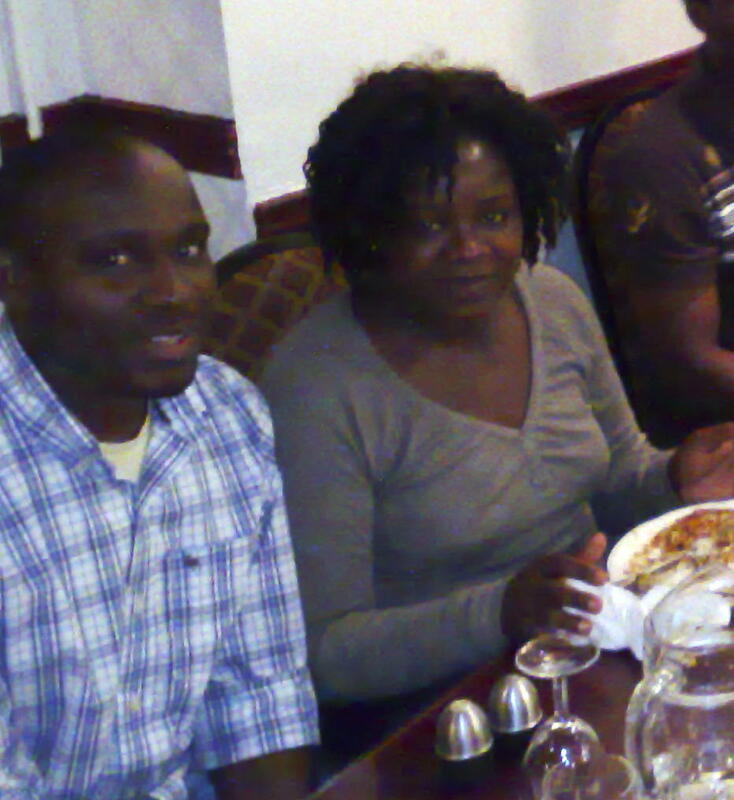 Whilst Jean Pierre languishes in Campsfield IRC in Oxfordshire, a volunteer from Asylum Welcome, a charity based in Oxford which helps asylum seekers, refugees and detainees, has a plan of action to stop Jean Pierre disappearing into the prison system in Cameroon, should he be deported. As in many other countries, on arrival back to Cameroon, deportees are handed over to security forces by immigration officials. Deported refugees often simply disappear into the prison system of the country they have fled. Jean Pierre will undoubtedly face further persecution if this happens to him, as is very likely. The plan consists of money being sent to a trusted friend in Cameroon on the day any deportation takes place. This money will then be used at the airport and buy Jean Pierre some valuable time so that he can go into hiding. This has been done successfully with other deportees on two previous occasions. Against ID cards, for migrants, for everyone! 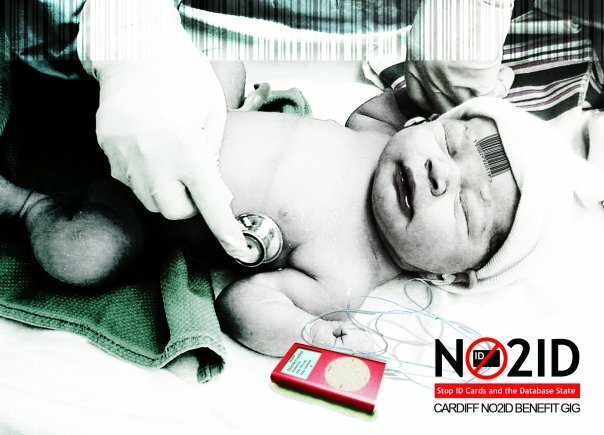 Last night there was a NO2ID benefit gig in Cardiff, organised by the local group, a few members of No Borders South Wales attended, and were well entertained by the performers; Lou Noble, Cosmo, Missdalogik, The Fix Up, New State Radio and Sicknote. We used the opportunity of the gig to give out copies of our new leaflet against ID cards that draws attention to the way in which migrants are being used as a testing ground for a repressive system that the UK government wants to impose on everyone. 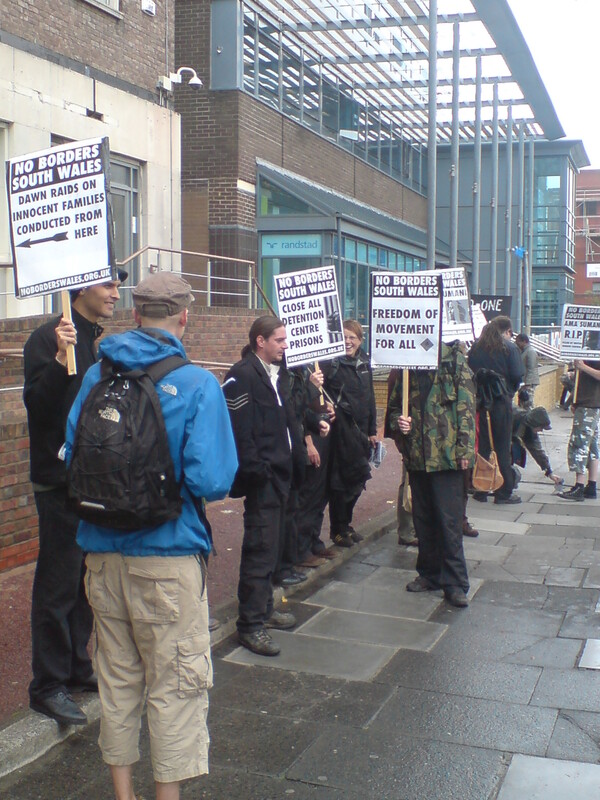 An article on the Cardiff Radical Socialist Forum “No2ID – with friends like these, who needs enemies?” has been the subject of some debate. 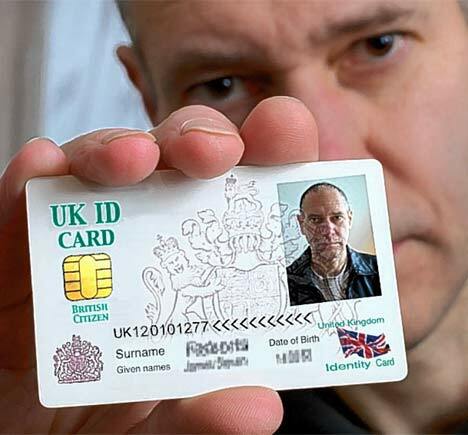 ID cards has long been an unpopular concept in the UK, meaning authoritarian organisations with no real respect for personal freedom have given their backing to the NO2ID campaign. We encourage opponents of ID cards to look at what is happening with the control of migrants, and see the thin end of wedge of the surveillance society. No doubt some of the less libertarian supporters of NO2ID would disagree with our stance on freedom of movement, hopefully others will agree. We wholeheartedly believe that the frontline of opposition to the creeping surveillance state is the defence of migrants, especially asylum seekers. Politically No Borders has affinity with the Defy-ID network, which came out of the libertarian milieu. There was a Cardiff Defy-ID group, though it appears inactive. No Borders Nottingham and Defy-ID Nottingham published an article “Defy-ID and No Borders – Better together” we echo their sentiments.